Synopsis: A psychotic murderer institutionalized since childhood for the murder of his sister, escapes and stalks a bookish teenage girl and her friends while his doctor chases him through the streets. Review: The high water mark from which all horror films of the 80’s and onward would be judged against, John Carpenter’s 1978 masterpiece more than earns its stripes and remains a surefire winner for those looking for a good scare. Movies like this that are such a part of our cultural identity can be difficult to return to because they can start to remind us of the imitation films we’ve seen along the way. Halloween bucks that trend with ease, making repeat viewings almost essential to remind audiences how to do horror right. Carpenter didn’t set out to make a genre defining classic when he wrote and directed the film on a shoestring budget. Originally intended to make some money to finance future projects, I’m not sure anyone really imagined the film doing the kind of business it did or receiving the kind of critical praise resaved for big-budget Hollywood films. Because Halloween was made with modest intentions, it had no preconceived notions or expectations of what it could become. It was created to entertain and scare the pants off of audiences and it does that and so much more. Before the credits even begin, Carpenter’s unforgettable score hits our ears and establishes a mood from the get-go. This is a film that has a heartbeat to it…and it brings you along with it making our pulse quicken right along with it. 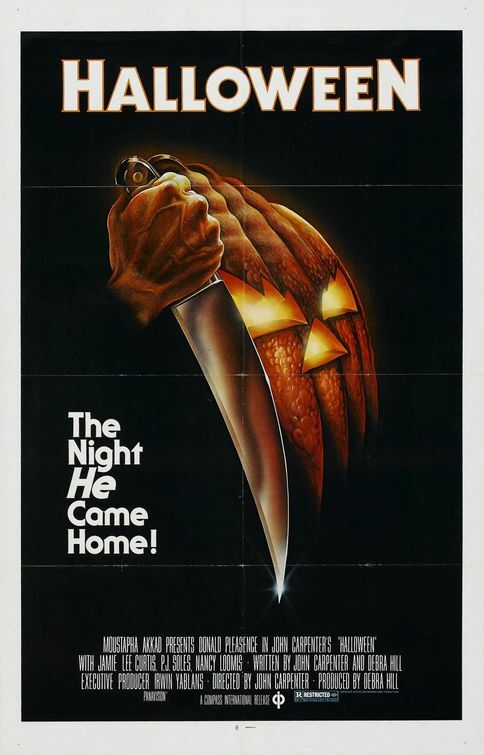 Carpenter gives us lasting frights as he puts the camera in place of a killer in the prologue, shows us what happens one rainy night at a mental asylum, and terrorizes poor Laurie Strode (Curtis) as she and her friends are stalked on October 31 by a masked killer returning to his hometown. The casting of Curtis was nearly a glorified publicity stunt. Wouldn’t the daughter of Janet Leigh (who so memorably took an ill-fated shower in Psycho) be great to headline her first film in the same genre her mom found such success with? Well…stunt or not it’s clear that Curtis was perfect in the role and it’s in her performance that I feel the movie really cements its place in history. Without a lead character to root for, the audience wouldn’t be as afraid for her as they are as she is hunted in the night by Michael Myers. Subsequent sequels would flesh out the connection Strode and Myers had but in this film it’s the not knowing what his motivations are that are the most frightening. In this first film the lumbering Myers (referred to as The Shape by many) doesn’t hunt his victims so much as he stalks them with an eerie curiosity like a caged animal would look at prey that has strayed too close to the bars. The deaths in the film are not without meaning or feeling…Carpenter is good at establishing who these people are before Myers dispatches with them. That’s not to say the film isn’t without its flaws. While Curtis is exceptional it’s strange that top-billed Pleasence has relatively little to do in this entry. He’d become a major part of future installments but he’s largely a secondary player here as the crux of the film involves Curtis and Nick Castle as Myers (ironically, Castle would go on to become a director of family-friendly films). As the best friends of Curtis, Soles and Loomis are a fun bunch but lack something in the acting department. Loomis especially confuses insincerity with wiseacre a bit too often…but it does play nicely off of the demure performance Curtis turns in. Most film fans know that Myers kept coming back for more over the years in sequels that couldn’t measure up (even though Halloween II is a strong follow-up and should be watched in tandem with the original). If you can, try watching the movie without thinking about the legacy that these films have spawned over the past three decades. It really is a masterwork of fright that’s on display here, a can’t miss and must-see film. I’ve seen it more times that I’ll admit here and continue to get something out of it with each viewing.